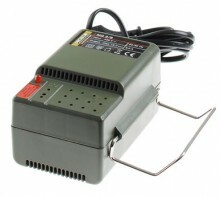 This is a 12V, 2A power supply for low-voltage Proxxon tools. With a safety thermal overload trip, this supply is suitable for running any single 12V Proxxon tool. In case of overtemperature, the supply will shut down, and can be power cycled to reset it after it has cooled. A red LED indicates when it's ready for use. Features include a folding tool rest on the side, and a small rack for holding bits and cutters. Power consumption of Proxxon portable machine tools is measured according to the internationally accepted ICE-745-1 specification. All Proxxon mains adapters are suitably rated for the recommended tools. Exactly as NG 2/E, but without electronic speed control. Click the button below to add the Proxxon MICROMOT Mains Adapter NG 2/S #28706 to your wish list.